Since I’ve been at Disney World, I’ve been collecting Vinylmations (or vinyls for short), which are basically like collecting Disney pins. They’re collectable, unique, you can trade them, and there are certain ones that are hard to find. Some of them have unusual hats or swords or other accessories, and they’re just so cool! Meet and greet signing event with the artists. I like the look of a lot of them, but I only really collect the ‘Park Starz’ series. Those are vinyls that look like icons from the Disney Parks, like the Orange Bird from the Sunshine Tree Terrace, which is next to the Tiki Room in Magic Kingdom. It is fun being a Cast Member because we have meetings once a day led by the managers and they go through important things, like events coming up or sale items, etc. 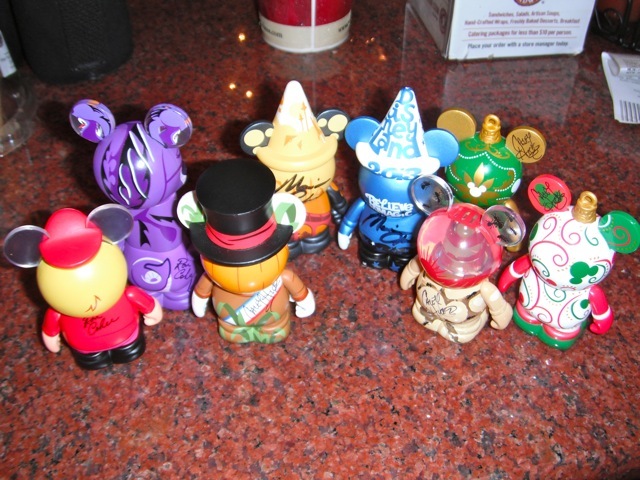 Today they announced that there’d be an ‘Artist Signing at D-Street’ (the store that sells the vinylmations at Downtown Disney) event. I thought that sounded pretty cool. On my break, I read the post myself and found out that there had been only one of these vinyl signings within the past 4 months. Luckily, I got off at 2:30pm so I could go. So, even though I was really tired from working since 6am, when I got off work I drove on down to D-Street in Black Friday traffic to go to the store since the artists were only there from 5-7pm. I thought it’d be crazy busy because the artists who actually designed and drew the vinylmations were there, but actually there was no line! 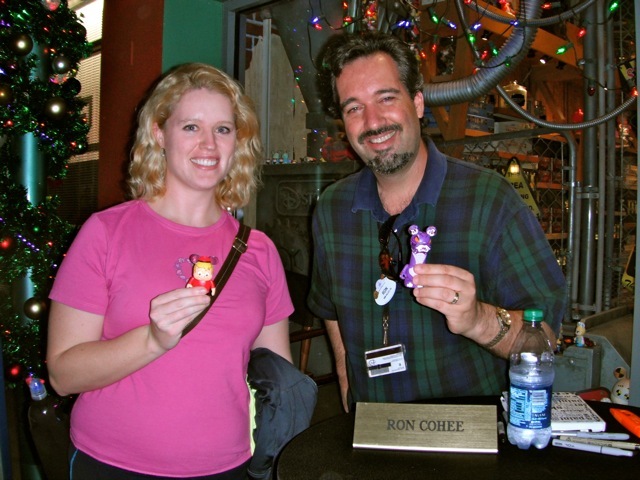 I love my vinylmation collection and it was so fun to meet the artists! They were just standing at a nice table outside the store with security on either side. I really liked the lady who was the artist who designed all the new “Frozen” vinyls. I got the Olaf one (the snowman from the movie) using my 40% off cast member discount, then went back out and had the artist sign it. I got a picture with all of them! 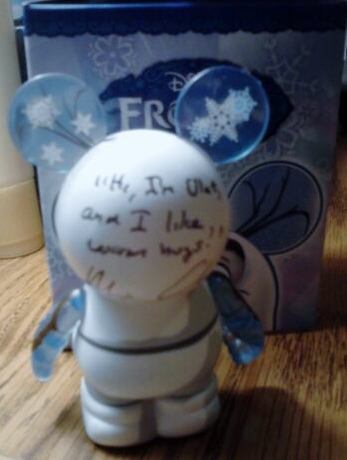 She wrote “Hi, I’m Olaf, and I like warm hugs!” and then her autograph! That’s Olaf’s main line from the movie. It was awesome because I just saw the “Frozen” movie yesterday, so I know what’s she’s quoting! I’m really glad I went because I got to meet some pretty famous artists who have designed really popular merchandise for Disney! Whoooooo! 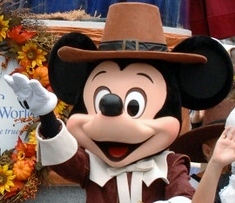 Caroline couldn’t come with me because she was working and Animal Kingdom has late hours this Thanksgiving week. Having Thanksgiving dinner with my CP friends. Thanksgiving is a great time of year because it’s getting to be close to Christmas! Normally, I love having a break from college and being home and doing fun things like decorating, eating good food, and going to movies. 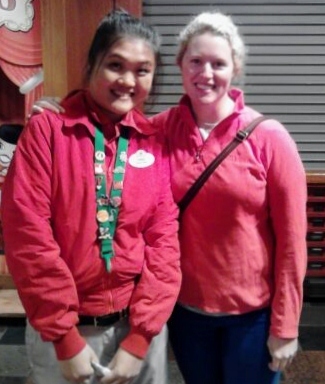 This year was a bit different because on Thanksgiving Day, Black Friday, and Saturday, I worked early morning stocking shifts, which mean I had to be at Downtown Disney by 5:30am. The CPs in the program with me all work nights, and normally so do I, because the full-time or part-time people work the normal day hours. So, it’s been really hard lying in bed waiting to fall asleep at my normal time of 2am, and then getting up at 4:40am for work (3 days in a row)! The shifts actually aren’t that bad; it’s basically processing the delivery of new merchandise, scanning it into the system, putting ink tags on everything, and then putting the merchandise onto the shelf or back in the stock room. 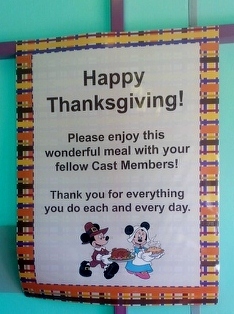 Thanksgiving note from the managers. 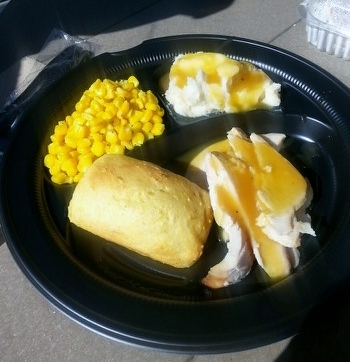 I like working holidays because Disney does a great job recognizing the cast members that are working, and this year we had a catered Thanksgiving feast luncheon by Boston Market, how perfect! During my break, the two other CPs who were working with me (Allie and Damyra) in the other stores in my zone joined me and we had a little lunch in the back lot behind Once Upon a Toy store. It was pretty good, but the feast was missing the stuffing and mac and cheese, both of which are so good from Boston Market! 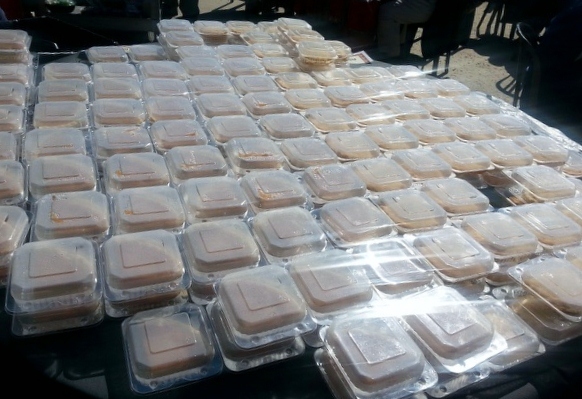 The managers served it to us too, which was pretty cool. The best thing about the food was the homemade cupcakes someone made. They were pumpkin cupcakes with spiced frosting, and inside of them was a little mini pumpkin pie (with pie crust and pumpkin pie filling), baked inside the cupcake. It was really cool and yummy! Cake & pie together! She also got to sleep in, which I was so jealous of because I’d been working 5+ hours by the time she got up. On Thanksgiving Day, I came home from work at 2:30pm and immediately took a nap! When I woke up at 5pm, we went to Downtown Disney. 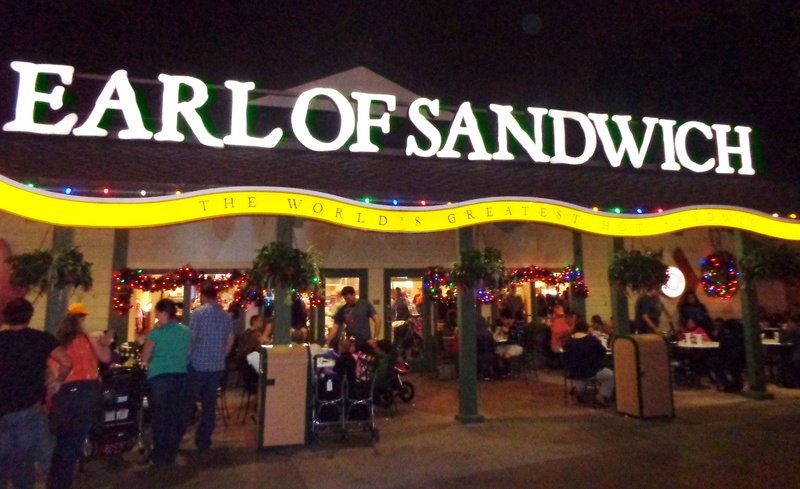 We had a fancy, gourmet, home-cooked dinner at ‘Earl of Sandwich’, lol! That was our Thanksgiving dinner, but Caroline actually got the “Holiday Ham”, which she said was very good. I had a chicken wrap, since I’d already had Thanksgiving food for lunch. 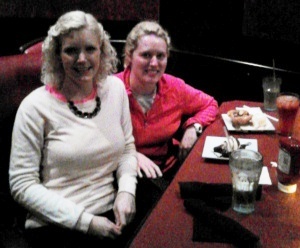 After dinner, we walked all the way to the other end of Downtown Disney, in the freezing cold, and we tried out the “Dine-In” AMC Movie Theater, which was FANCY! The chairs are huge leather sofa type chairs and you have a table in front of you, and a waitress. Caroline got a holiday drink called the “Snowball”, which came in a round glass and was white. It tasted like peppermint. We both got desserts and it was very fancy! The Disney movie “Frozen” just opened and was AMAZING! Best movie EVER! I loved every one of the songs, and it really blew me away. We’re planning on seeing it at least 2 more times and buying the sound track immediately! So awesome! At AMC, having drinks and watching ‘Frozen’. If you’re wondering what Downtown Disney looks like at 5:30 in the morning, it’s COLD (41 degrees) and DARK (sunrise isn’t until 6:50am). All the Christmas lights are turned on and it’s very quiet. 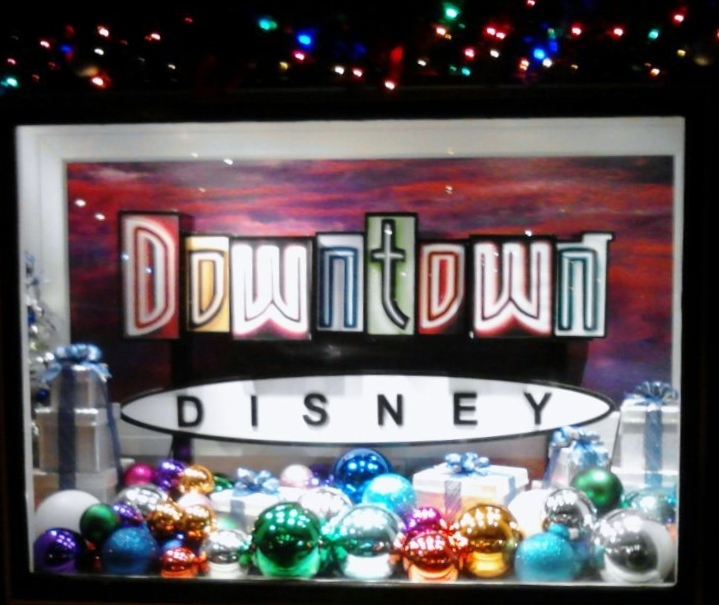 Downtown Disney Christmas display. So pretty! My friend, Ting, works at Pin Traders with me. Thanksgiving weekend. Off to work at Team Mickey. We went to see Disney’s “Frozen” last night at the AMC theater in Downtown Disney. You can actually get dinner while watching a movie there. We both got desserts and it was very fancy! Having dessert while watching the movie. We liked the movie a lot, but were frozen ourselves while driving home; it was so cold! 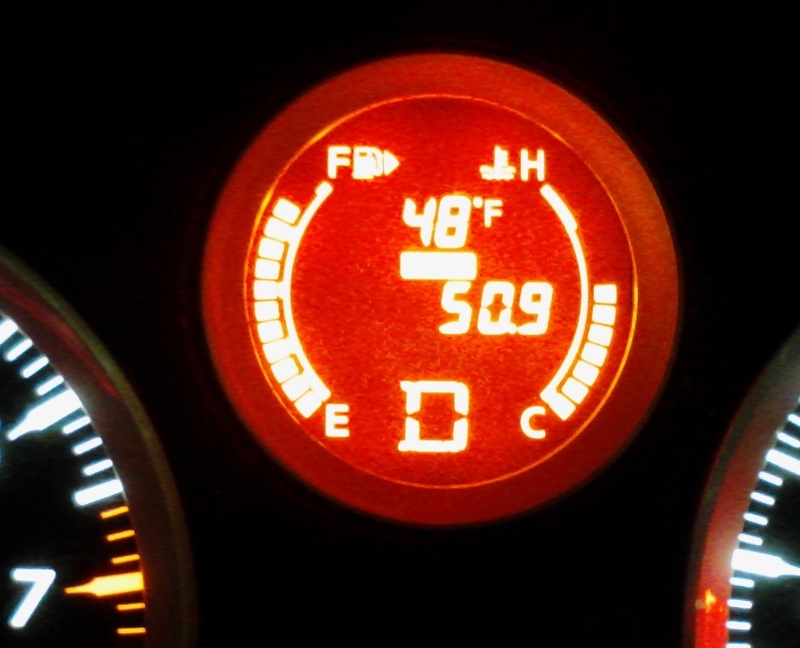 Only 48 degrees when we left the movie. Burrrr! 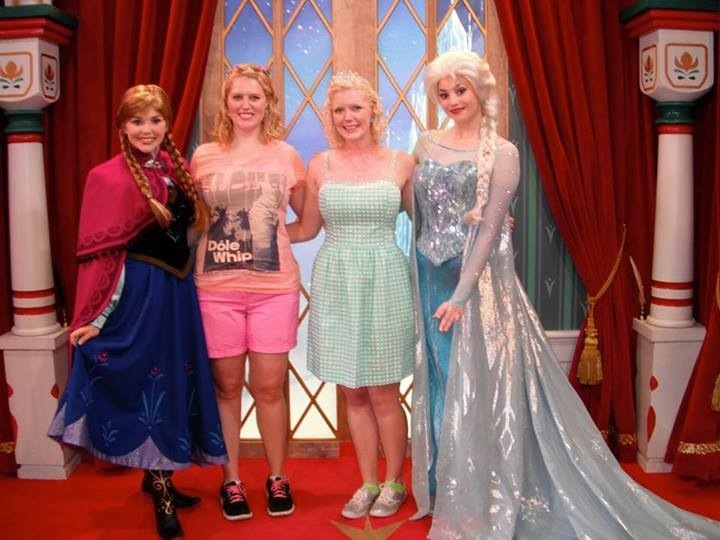 A photo of us at the ‘Frozen’ meet & greet in EPCOT-Norway a few weeks ago. 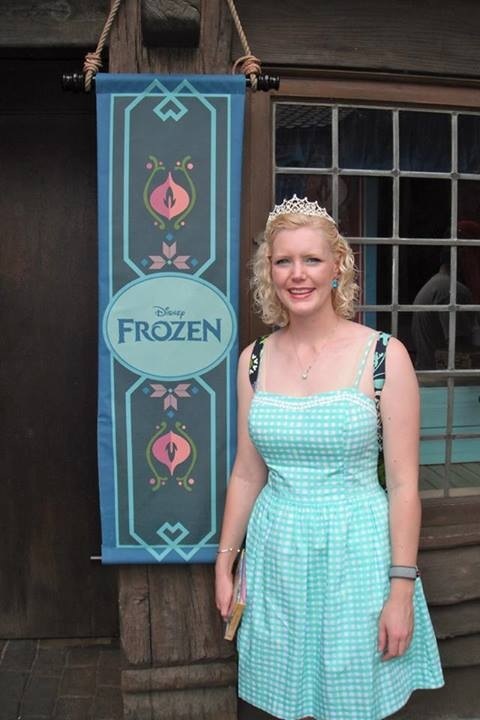 Caroline at the ‘Frozen’ character meet & greet area in Norway. Frozen movie poster. Loved this movie!! 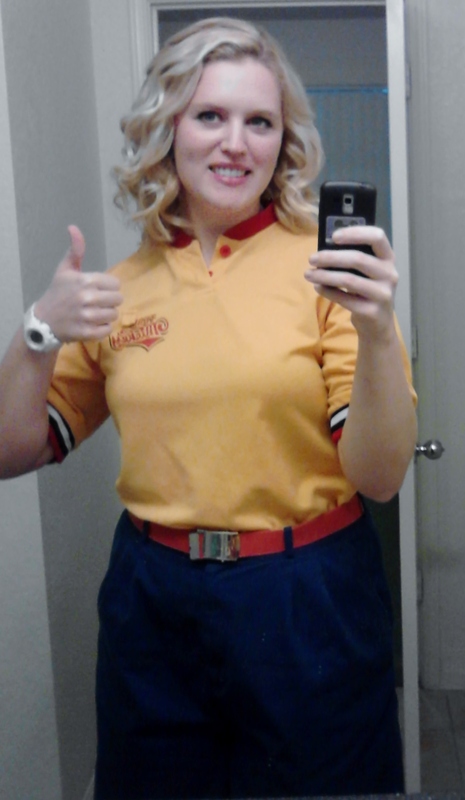 Off to work at Team Mickey. 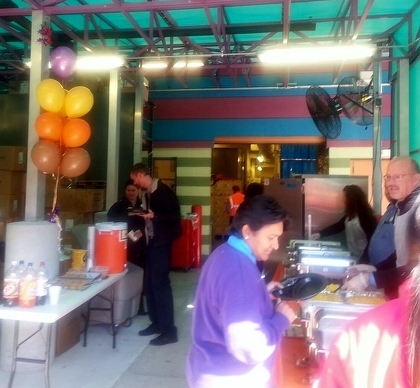 Elly was working, so my roommate DeeDee and I went to the Thanksgiving party at Chatham Field on Wednesday night. The food was really, really good, but I had just eaten, so I brought a plate of Thanksgiving Dinner home for me and Elly to share the next day. They scanned our ID badges, so you could only go thru the buffet line once, but the portions were huge! Celebrate turkey day early with a home-style dinner! We hope you’ve worked up an appetite, because tonight, we’ll be hosting our winter diversity event, Thanksgiving! 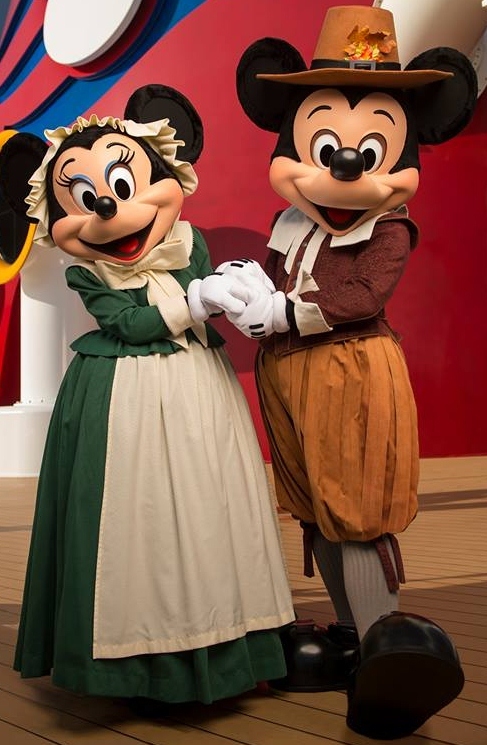 Sliced turkey, mashed potatoes, cornbread stuffing and cranberry sauce will be served, along with other traditional holiday fare, and rumor has it that classic Disney characters will be joining in the festivities! Also, don’t miss a great opportunity to donate toys to Toys for Tots. 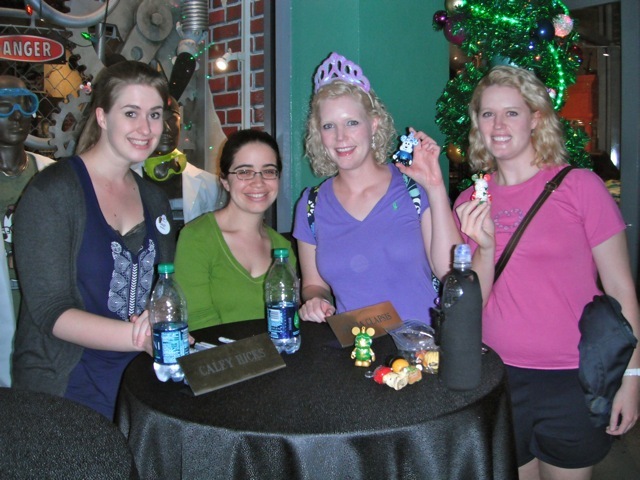 If you bring a new, unwrapped toy to the event, you’ll receive a small token of appreciation from the Housing team. 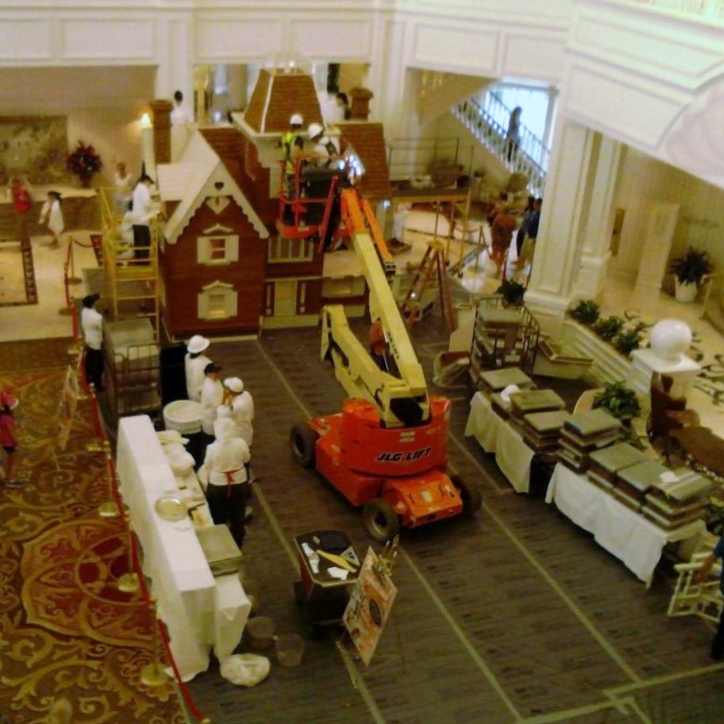 They put up the Grand Floridian Gingerbread House while we were staying there. It’s so beautiful! The Gingerbread House is surrounded by red poinsettia and greenery. 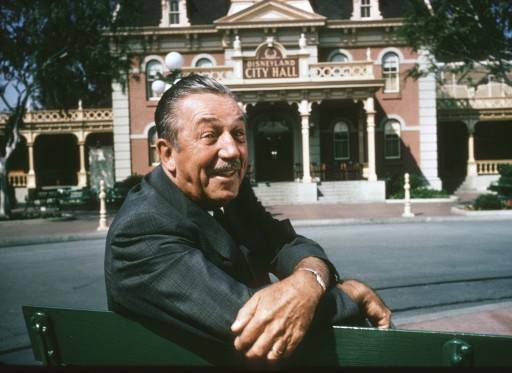 There are Hidden Mickey’s in the shingles. The chefs make extra gingerbread shingles and dip them in dark chocolate. You can buy them in the gift shop. The dusting of the gingerbread house takes 10-15 minutes. 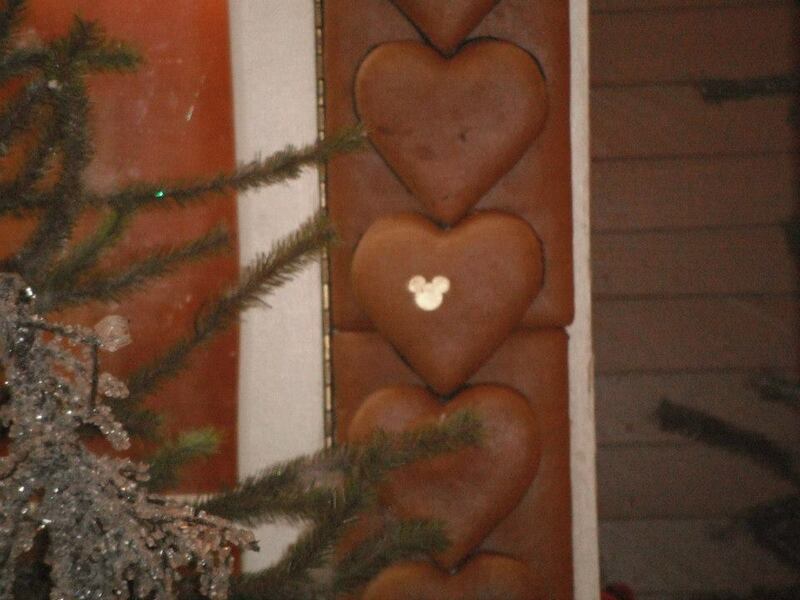 The chef squirts down the gingerbread with sugar water, and then sifts powdered sugar onto the house. 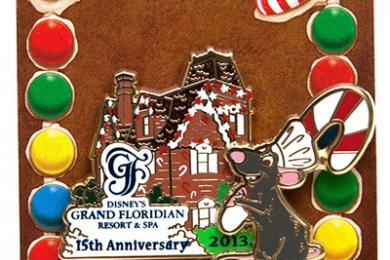 The Grand Floridian Gingerbread House is celebrating its 15th year! The 2013 ingredients include 1,050 pounds of honey, 600 pounds of powdered sugar, 800 pounds of flour, and 140 pints of egg whites! 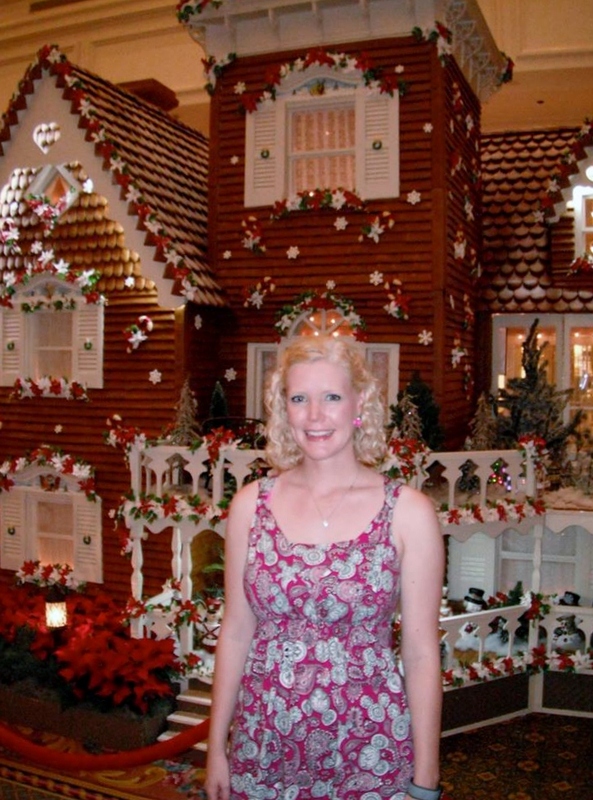 The Gingerbread House stands 16 feet tall. Caroline visiting the finished Gingerbread House. 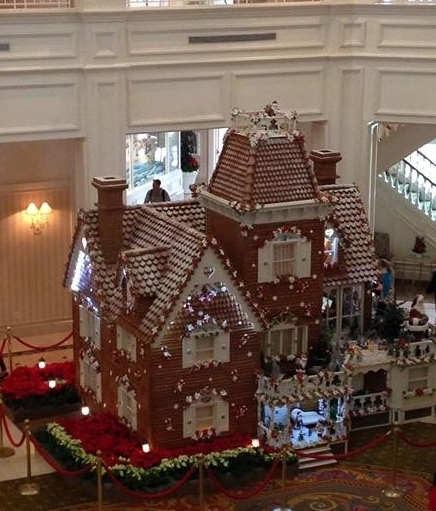 After 400 hours of baking, the chefs spent 160 hours decorating the house. 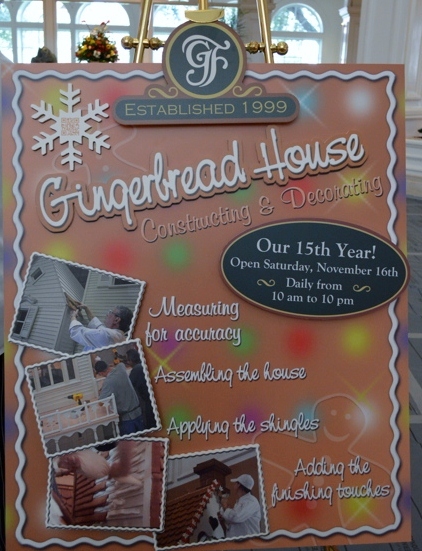 This unique 80 square feet of retail space is 16 feet high by 17 feet wide and constructed with 1,000 board feet of trim, 60 sheets of plywood, 40 window panes, 100 square feet of display, and 10,000 pieces of gingerbread used.